This double disc set is quite cool. 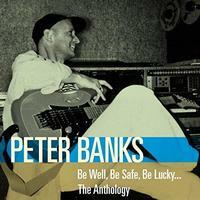 It includes a sampling of songs from several Peter Banks albums, but there are also a number of previously un-released or nearly un-released cuts, too. It's quite a good cross section. I'd recommend this for an introduction to Banks' solo work. It should be noted that I reviewed quite a few of these tracks on their original albums. For the sake of consistency, those reviews are used here or at least modified for use here. Mellow jazz guitar is the concept here. Banks shows immediately that he really masters the instrument, but still manages to pack this full of nuance. This number comes from Instinct. Originally from the same album as the previous cut, weird clips start this number, and then some world music vocals enter. The cut works out from there to some ambient weirdness before threatening to start rocking. It rises up with a more rocking fusion kind of sound as it carries forward. There are some soaring world music melodies as this drives forward. Banks puts in some awesome soloing, but it's always in service to the whole song. As you might guess of a song with this title, the track is a bit ambient and moody. It's a little trippy and quite pretty. This is another from Instinct. Coming out of the previous number, this has a killer funky groove to it. It's a killer fusion jam. There is a surf-guitar section as it approaches the mid-track point. It works back out to more of the powered up fusion sounds. It eventually drops back down for a bit of a noisy closing bit. This was originally released on Reduction. Coming from Two Sides of Peter Banks, this fires out with a killer hard edged jam that calls to mind King Crimson a bit. After that ends, waves of atmospheric, fusion-like guitar take over. It grows out from there as Banks’ guitar playing gets louder and more adventurous. Here we’re reminded of Flash, but also of early Yes. A pounding, harder rocking movement takes it from there. More melodic atmospheric stuff (with some backwards tracking) takes it to the end. This comes in mellower and quite intricate and pretty. It grows outward by building upon that musical concept. This was originally released on Reduction. Coming in energized and more rocking, this is killer stuff. It really has some great musical elements at play. There are definite fusion elements in the mix. This track comes from Self-Contained. As you might guess this one is not only from the same album as the previous cut, but it's part of the same suite. A mellower piece, this seems to come out of the last one. It has some shifts and changes as it works through. Coming from the Reduction album, the music elements start to grow outward with a bit of a King Crimson turned funky approach. Still, it's rather understated in a lot of ways. This gets pretty fusion like as it continues. The intensity really builds, and there is some exceptional guitar work here. A smoking hot rocker, this thing is so cool. Banks' guitar work is (of course) impeccable. He is screaming hot. This is another from Reduction. Coming from the same album as the last couple pieces, this is mellow, intricate and pretty. It ends with bird sounds after the announcement that, "I'm going to let the bird out." This is a remake of a song from Flash. It comes in by fading upward as it seems to be already in motion. The cut works through the melodies we expect from it. There is a techno meets fusion vibe to it, though. There are some bits of funk built into this version of the tune. This does retain a little bit of the vocal part of the tune. While this wasn't precisely unreleased, it was only available on a CD that came with a book. This comes in feeling quite a bit like something from the first couple Yes albums. More changes ensue, but still I’m reminded of that period of Banks’ earlier group. There are some cool keyboard voicings to be heard here and there along this road. This was originally released on Two Sides of Peter Banks. This starts a bit tentatively but turns out to a more song oriented piece. It has some killer fusion elements at play. The cut has some cool changes and has some definite rock-oriented moments. It also gets into more dropped back, electronic styled things. I really dig the guitar work on this, but that is pretty much a given. This one is from Self-Contained. Coming from the same album as the last number, there is a little radio snippet of two people talking about Yes at the beginning. Then some moody, mellower music rises up to drive the piece forward. While pretty, there is a melancholy vibe to this cut. Can I Play You Something More? This is just a short bit of a phone ringing and two people talking. This number comes from the Can I Play You Something? album. You could probably guess that from the title, though. Another short bit, this is just sort of a build up. It comes from the same album as the previous piece did. Here Banks and crew put in a smoking hot rendition of the classic Henry Mancini theme song. There is some killer saxophone work built into this, and it really screams. This thing is a real powerhouse that's smoking hot. This is another from the Can I Play You Something?album. The credits say that this is based on a Mabel Greer's Toyshop loop. It's a weird bit of psychedelia with some spoken words built onto it. This one comes from the same album as the last few songs. Coming in freaky, this works out into something that has some Crimson like weirdness at its core. Percussion takes over, moving the piece out to sort of a fusion based guitar showcase. It seems to get a bit noodly for my tastes before working out around the two minute mark to more of a cool rocking section. That mode feels a bit like early Yes and has some psychedelic rock built into it, too. It works through quite a few different things along the course of the number. This was originally released on Guitar Workshop II. Coming in rather atmospheric, this has sort of an unusual pop rock vibe to it. It's a bit left-of-center, but also quite cool. It gets into some harder edged guitar jamming further down the road. Again it has a tendency to get a bit noodly for a moment or two, but then fires out into some killer exploratory jamming from there. There is a decidedly Flash like jam at the end. This is from the same album as the last track. This is a short little loop that has a spoken sound bite. It's only 15 seconds long, so there can't be that much there. We're back to the Can I Play You Something? disc here. For a few moments, this one calls to mind the surf sound of the early `60s (ala The Ventures). Featuring an intriguing arrangement, this interpretation is quite interesting and includes a nicely energetic and dramatic build up to the conclusion of the piece. This features Robert Berry handling everything but the guitar and comes from the Various Artists set Tales from Yesterday. A previously unreleased piece, I dig the cool off-kilter jamming on this piece. It's very King Crimson like in a lot of ways. It's less than an minute and a half in length, but manages to showcase different instruments during that time. Ambient, textural and pretty, this is a short piece. It has a lot of nature sounds built into it. This one was originally released on the Can I Play You Something? album. Previously unreleased, this has a trippy kind of ambient musical element to it. Echoey and almost new age based, this is dreamy and cool. Rather trippy, this starts with some sound bites and grows out from there. It is another that lands under new age type stuff. This comes from the Can I Play You Something? album. Echoey and trippy, this is another that definitely lands in the vicinity of new age. The second half of the piece gets a bit more powered up, but the basic concepts continue. This was previously unreleased. Here we get a nearly twenty-minute long revisit to "Small Beginnings." It has the main riffs and sounds of the original present, but brought into a different framework. This thing is such a cool piece of music in this format. Of course, it is a killer track in any form, and this is no exception. It really has a lot of varying movements and sounds. This has a few of the vocals from the song. This is another track that came from the CD that accompanied the Beyond and Before book. The closer was originally released on the Can I Play You Something? album. This is a trippy, atmospheric cut that works quite well.